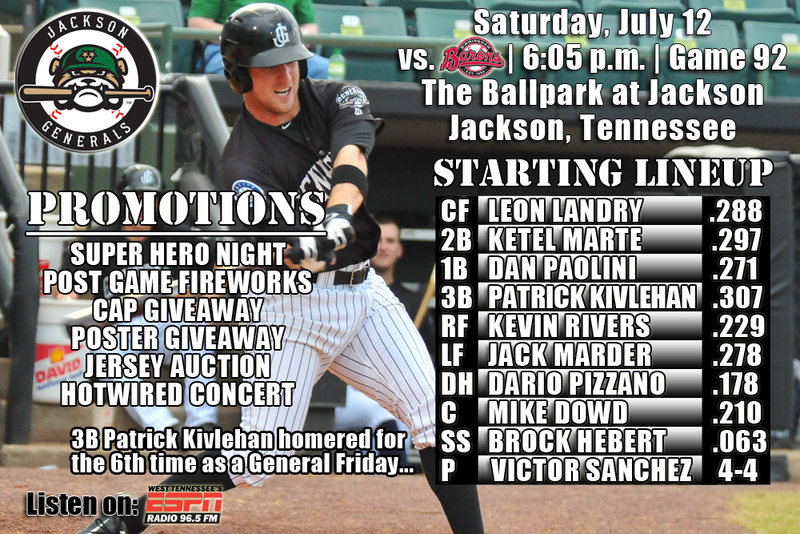 • The Generals continue a 5-game homestand tonight against the Birmingham Barons in Jackson with game 3 of the series (1-1)…are coming off a series win at Huntsville (3-2) and have won 4 of 6…also are 4-3 against Birmingham this season and will play the Barons 8 more times in Jackson the final 23 home games of the season. • The Generals got home runs from LF Patrick Kivlehan (2×3, HR, 2 RBI), DH Dario Pizzano (1×1, HR, 2 RBI, 3 BB) and defeated Birmingham 6-2 to even the series on Friday. • Pizzano reached base in all 4 at-bats including a solo home run in the 3rd inning after Kivlehan hit a 2-run homer two batters earlier. CF Leon Landry (2×5) and D.J. Peterson (2×4, 2 R) added two hits each of Jackson’s 11. • Starter Stephen Landazuri (4.1,5,2,2,3,3) did not factor into the decision leaving in the 5th inning and RH Matt Brazis (3.2,0,0,0,1,3) earned his first AA win. Brazis has faced one over the minimun in 7.1 innings to start his Double-A time, allowing 1 hit and 1 run in 2 games.RH David Colvin (1.0, 0,0,0,0,0) pitched a perfect 9th inning. • The Generals have posted double-digit hit totals and batted .316 (66×209) over their last 6 games, winning 4 of those, scoring 35 runs on 66 hits with 9 doubles, 3 triples and 10 home runs. • Jackson now ranks T-3rd in the league doubles (163), 2nd in triples (30), 4th in slugging (.386) and 3rd in batting (.262) on the season. • In 2 relief outings since coming up from A+ High Desert, RH Matt Brazis has faced 1 over the minimun in 7.1 innings. He gave up a solo home run to Greg Hopkins in his first outing which was the only hit or run allowed. He has walked 1 and struck out 6 so far. • 3B D.J. Peterson homered on Saturday, Sunday and Tuesday in Huntsville and has now hit safely in 14 of 15 games with Jackson, including 7 straight. Peterson is batting .290 (18×62) with 8 runs scored, 4 doubles, 3 home runs, 7 RBI and 4 walks. • Hot Hitting July – After batting .294 as a team in June, the Generals are currently batting .278, which ranks 2nd in the league. The 11 home runs ranks T-2nd in the league. • INF Dan Paolini has hit safely in all 9 games he has appeared in July, batting .438 (14×32) with 6 runs scored, 4 doubles, 2 home runs, 7 RBI and 2 walks. Paolini currently leads the team in homers (6), doubles (25) and RBIs (46). • OF Leon Landry has hit safely in 6 straight games, including 4 multi-hit games, batting .357 (10×28) with 5 runs, 1 double and 1 RBI Since June 7, Landry has hit safely in 25 of his last 28 games with 15 multi-hit efforts, batting .366 (41×112) with 18 runs scored, 6 doubles, 3 triples, 6 RBI, 3 walks and 10 stolen bases. During this 28 game stretch he has raised his season average from .236 to .288. • Success against Birmingham at home – Since 2008, the Generals are 33-17 (.660) at home against the Barons. • Baron vs. Barons – C Steve Baron, Seattle’s supplemental 1st round pick in 2009, made his first Double-A start Friday and was 1-for-3 with a double and RBI. • RH Richard Vargas has appeared in 7 games since the All-Star break going 1-0, and is 3-for-3 in save opperunities, not allowing a run in 8 IP. Vargas has walked 4 and struck out 10, while giving up just 2 hits holding opponents to a .069 AVG (2×29). This is after going 0-1, with a 6.12 ERA in the first half going 2-for-4 in save oppertunites walking 24 and striking out 30 in 32.1 IP. • D.J. Peterson will not be with the Generals on Saturday and Sunday because of his travel and playing in the Futures Game on Sunday. He was named to the U.S. Team for the 2014 SiriusXM All-Star Futures Game. Peterson will be joined at the All-Star Futures Game by High Desert outfielder Gabby Guerrero, who will play on the World Team at the July 13 game at Target Field in Minneapolis as part of the All-Star Week festivities.